The Mane Objective: Can The Mane Choice REALLY Cut Your Wash Day In Half? Can The Mane Choice REALLY Cut Your Wash Day In Half? So you know, like I know, that when a brand makes a claim about their product - I'm gonna investigate it. 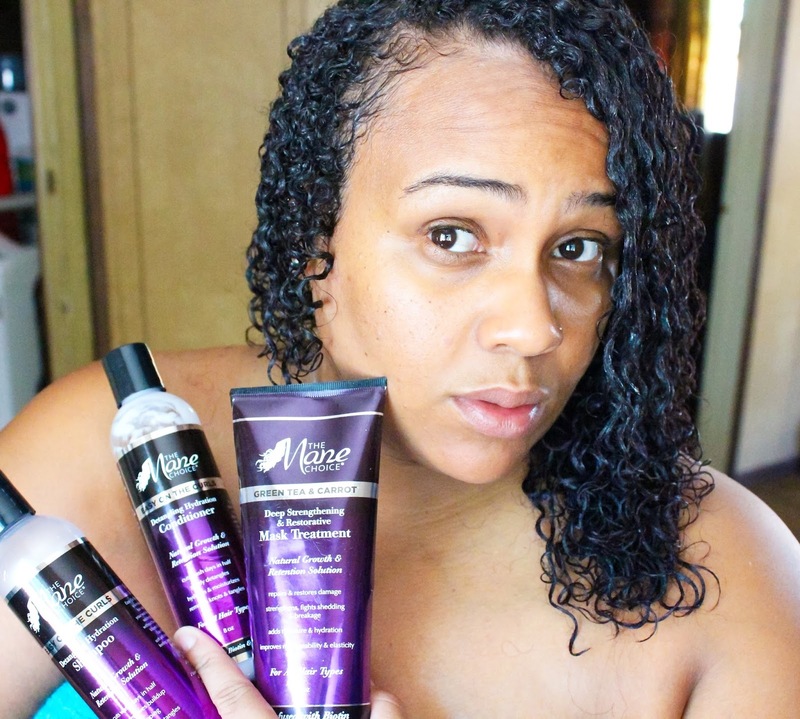 When The Mane Choice debuted their Easy on the Curls collection, I was like, "Oooh! Cool!" When I noticed they had re-formulated their Green Tea & Carrot Mask Treatment, I was like, "Ohhhh-kay now!" (because I had always wanted to try it, but heard that those who loved it wish it had more slip). And THEN they said, "Easy on the Curls will cut your wash day in half!" and I was like, SKRRRRRRRRRRRRRRRRRRRRRRTTTTT! You mean to tell me, that your products are quite literally, going to cut my wash day in half? On a shampoo day no less? So I reached out to The Mane Choice team, and told them my idea - that I wanted to put their claims to the test. On video. They loved the idea, so here we are! I have two types of wash days: co-wash and shampoo wash.
Co-wash days run me about 45 minutes to detangle, cleanse, and deep condition - because I use the same product to detangle and co-wash my hair. Shampoo days run me at least an hour and 10 minutes, because I always detangle my hair prior to shampooing (30 minutes), shampoo in sections (20 minutes), and then deep condition (20 minutes). For the purposes of the #WashDayChallenge, I'm using the timing from my shampoo wash days. To tackle my 5 day old tangled tresses (I normally wash my hair every 4-5 days), I'm using The Mane Choice Easy on the Curls Detangling Hydration Shampoo, Detangling Hydration Conditioner, and Green Tea & Carrot Deep Strengthening & Restorative Mask Treatment. To see this wash day unfold in real time, watch the video! Then, keep scrolling for details on the products used. Aloe Vera Leaf Juice: Acts as a natural conditioning agent that restores the hair's sheen, luster, and shine. It not only makes the hair soft, but it also enhances strength and suppleness by sealing the cuticle layer. Any time I shampoo my hair, I alllllways pre-treat it with conditioner. Sometimes oil (rarely), but mainly conditioner. 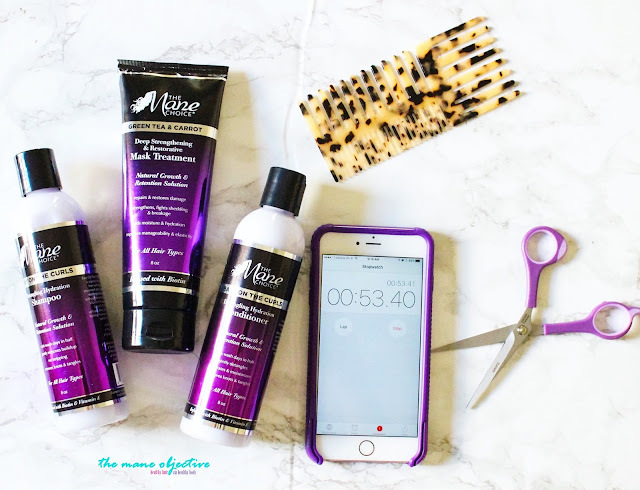 This serves two purposes - one, to get the detangling process started and two - it gets the hydration party started and counteracts the stripping nature of shampoo without compromising cleaning ability. That's how I used the Detangling Hydration Conditioner. I soaked my hair with water (the white buildup you see in the video is the second coming of my gobs of gel being reactivated by the water). I then covered my hair in the conditioner, and set out to separate it in to four sections to finger detangle, one by one. I kept a spray bottle of warm water on standby, to help saturate each section - which is what I do on shampoo days, to avoid wasting tons of water in the shower on detangling only. Y'all. Y'ALL. Lean in. I need to tell you something. Never, not never in my almost three years of being natural life, have I EVAH finger detangled my entire head of hair in under 10 minutes. Without even being in the shower. The Detangling Hydration Conditioner is the real deal. We're talking on 5 day old hair here - hair that hasn't come close to a finger, comb, or anything since my last wash. Hair that's been worked out on, slept on, and gone with the wind. On the ingredient tip, the Detangling Hydration Conditioner contains some of my absolute favorite ingredients - like aloe vera, avocado oil, and cetrimonium chloride. Hear me out though. My hair loves anything with aloe, because it's pH balancing, shine enhancing, and scalp soothing properties. Avocado oil is one of my favorite in-product oils because it's not too heavy or too light. And let me love on cetrimonium chloride for a minute. I've discussed this ingredient before when it comes to strengthening the hair and straightening it. 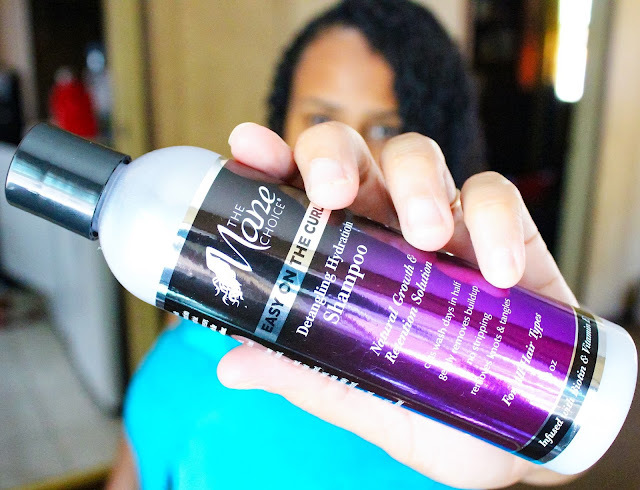 When combined with heat, it improves the tensile strength of hair (read: less breakage). 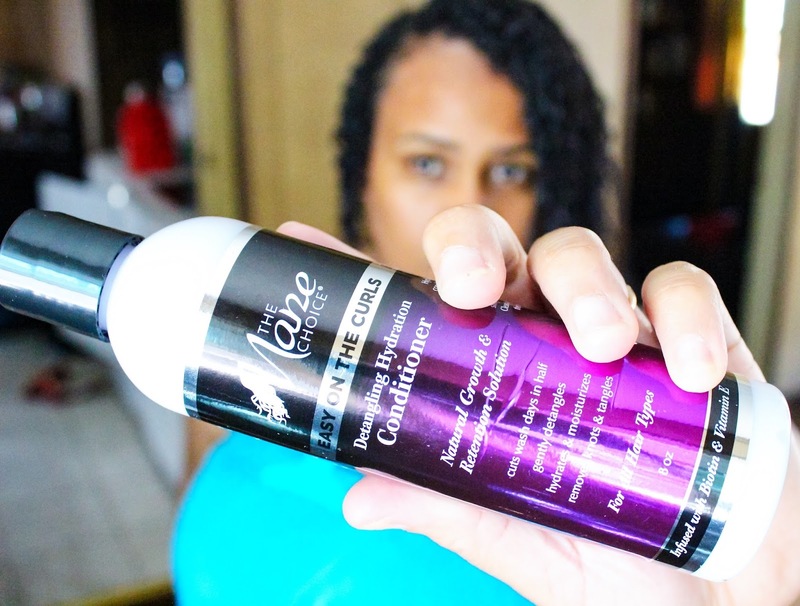 Although I didn't use it with heat for the Wash Day Challenge, it's good to know that the Detangling Hydration Conditioner is valuable for so much more than detangling. Official Time: 7 minutes and 10 seconds to completely detangle my hair. Chamomile Flower: An extraction of chamomile that provides soothing, anti-inflammatory support to the scalp and follicles. Clary Leaf Extract: Herbal extract of the clary sage leaf with antibacterial properties that also encourages growth and slows shedding. Lavender Extract: Soothing, anti-inflammatory herbal extraction. Birch Bark Extract: Anti-inflammatory and scalp-soothing extract that promotes healthy skin, fights dandruff, eczema, and psoriasis, while slowing hair loss. Immediately following the Detangling Hydration Conditioner, I rinsed my hair and got right to shampooing. As I mentioned previously, I shampoo in sections (it's just easier that way), and today was no exception. As you can see in the video, the Detangling Hydration Shampoo was EVERYTHING. I couldn't fake or make my reaction up. I was legit shocked. And impressed. I shampooed my hair in record time - especially considering that I was not in the shower (running water does wonders for slip). Winner winner chicken dinner! 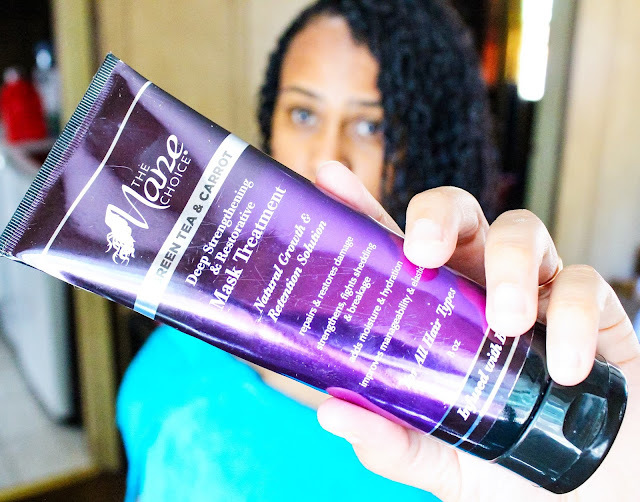 The Mane Choice Detangling Hydration Shampoo is the truth. La verdad. Sorry, I just started watching Power this week (literally starting with season 1) and all the espanol got me feeling like I'm bilingual lol. But I digress. There's a special place in my heart for shampoos that don't make your hair feel like a brillo pad in the desert upon contact. And truthfully, there are only an elite few shampoos that don't have this effect on my hair. The Detangling Hydration Shampoo is now one of them. Not only do I love the major slippage, the botanical ingredients are out of this world. Clean scalp, clean hair - not dried out or crispy in the slightest. Talk about a win! Official Time: 16 minutes and 53 seconds. Aloe Vera Leaf Juice Acts as a natural conditioning agent that restores the hair's sheen, luster, and shine. It not only makes the hair soft, but it also enhances strength and suppleness by sealing the cuticle layer. Honey Extract: Humectant and emollient which helps soften, smooth, and retain moisture in the hair. It is also rich in vitamins and minerals, which can help condition the hair leaving it shiny and soft. Honey also has antibacterial and antioxidant properties which help reverse and prevent damage, and promote scalp health. Green Tea Extract: Natural antioxidant and proven DHT blocker (one of the main causes of hair loss), antibiotic, and stimulates blood circulation to follicles - which promotes hair growth. The Green Tea & Carrot Deep Strengthening & Restorative Mask Treatment label says to apply the product generously from root to end after shampooing - then to cover with a plastic cap and sit under the dryer for 15 minutes, or up to an hour without heat. Because I never deep condition for an hour (it's just not in the cards for me, unless I'm out running errands), I opted for the 15 minute session. When it comes to deep conditioning, I leave no strand uncovered - so I was extra generous with my application here. First of all, I wanna just say that the Green Tea & Carrot Deep Strengthening & Restorative Mask Treatment is ah-MAY-zing. I see why everybody went nuts over this deep conditioner when it was released. Between the super moisturizing ingredients like aloe vera, honey, and coconut oil, and the strengthening and stimulating ingredients like green tea extract, biotin, and hydrolyzed wheat protein made my strands uuuuuuuber happy. Y'all know I love me some protein. And the slip was legit. After rinsing out the deep treatment, my hair looked and felt intensely nourished and restored. My curls was paaahhhpin! Official Time: 39 minutes and 28 seconds for an ENTIRE wash day including deep conditioning!!! You guys, I was over the MOON hype when I came from rinsing my hair, and realized that it literally took me half the normal time to get through my wash day. Y'all... The Mane Choice is the real deal! Join me in taking the #WashDayChallenge - head to your local Sally Beauty, Target, or Rite Aid and pick up the Easy on the Curls Detangling Hydration Shampoo, Detangling Hydration Conditioner, and Green Tea & Carrot Deep Strengthening & Restorative Mask Treatment. Let me know in the comments below if you try them out - and if you also cut your wash day in half!!! Note: This video and blog post is sponsored by The Mane Choice. Per the FTC, I have to tell y'all that. But you guys know, I'm completely honest in how I feel about products whether a review or video is sponsored or not. All opinions expressed are my own. Now I want to try these! I like that the DC comes in a tube.